Vacation in the heart of Central Florida’s most famous vacation destination – Orlando! 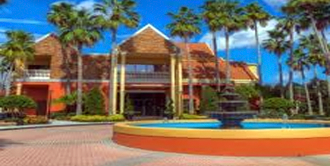 Legacy Vacation Club Orlando located in Kissimmee, Florida puts all the magic, sun and fun virtually on your doorstep. You’re just minutes from the Walt Disney World® and Universal Orlando theme parks, as well as the many other exciting attractions Orlando has to offer. All units are spacious and fully furnished with everything you need for your Orlando vacation. We’ve thought of everything that can make your stay carefree and relaxing — which is exactly what makes this resort enchanting for children and the young at heart. All accommodations are smoke-free environments. Marketplace: Coffee, Muffins, Salads, Sandwiches & more!